The large Schyven / Van Bever organ of the Notre-Dame in Laeken (Brussels, Belgium) showcasts the height of romantic organ building in Belgium. Having worked together with Cavaillé-Coll, Pierre Schyven developed his own unique style of organ building. His organs show many similarities with the organs of the grand french master, but still display their own tonal character. Powerful reeds, beautiful solo flutes and a strong, but not piercing Tutti, mark the sound of this beautiful instrument. 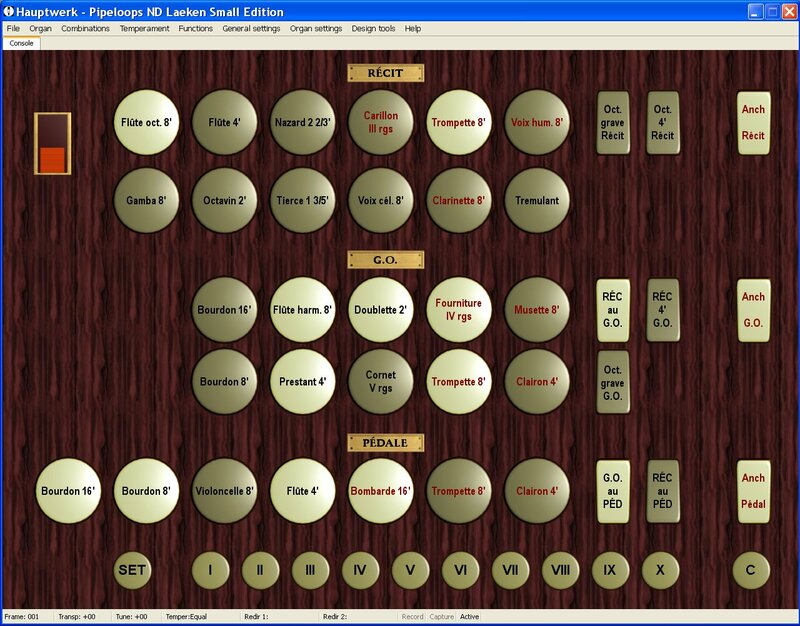 We are now offering a smaller set derived from the samples of the large Laeken organ. This set is a complete and well balanced instrument in its own right, comprising 28 stops on two manuals and pedals. It is built from those ranks of the original Laeken recordings that have been recorded separately (not in combination with others). Some additional ranks have been derived from this material to make the disposition complete. This sample set is available only for Hauptwerk 3 and above. It features three release sample layers (the original recorded release plus two layers created artificially for staccato and portato notes) resulting in a superb rendering of the cathedral accoustics. Note: The samples are encrypted using Hauptwerk's standard copy protection scheme. A dongle update is not required to use this set. Unencrypted samples may be made available to customers on request. The organ definition file (ODF) is not encrypted. This sample set is available as download only. To install the licensed version the free trial version of this set must be installed first, as the licensed version only contains a new organ definition file. You can also download the User's manual for more info. A free trial version of this sample set is available. Please look at the 'Trial-Version' tab for details. The sample set features 28 stops on two manuals plus pedal, the usual couplers, plus ten general pistons to facilitate registration. In addition to the full recorded release samples, two additional release layers have been created using convolution reverb. We have pioneered this technique in our Madeleine sample set with great success, and also in this sample set the result is remarkable. All stops have been recorded with two Neumann microphones directly to digital tape, at 16bit 44100Hz. There are four samples/octave for most stops, the celeste has been sampled note by note. The Voix humaine on the Récit has been sampled with tremulant "on", since it is mostly used this way and to give the most realistic tremulant sound possible. Hence the Voix humaine stop is not affected by the Récit tremulant, which is implemented using HW's wave form technique. This sample set is designed to be used with Hauptwerk™ version 3.20 and above and will not work with other sound producing software. It requires a modern PC with at least 4GB available memory and an operating system supporting Hauptwerk and large sample sets. The Hauptwerk Free Edition will be able to load and play the samples contained in this package, however, due to the performance restrictions imposed by the Free Edition only part of the organ can be loaded into memory. There are separate definition files for people using monitors with 1024x768 and 1280x1024 pixel resolution. The set requires approximately 3000MB of memory (Hauptwerk plus sample set data, excluding operating system, meaasured on Windows X64 system) using Hauptwerk's default loading options (16 bit stereo, lossless compression, loading all loops and all release levels on all ranks). Hence a PC with 4GB of available memory is recommended. Since the reverb tails are very long a dual core CPU is required to achieve sufficient polyphony. Here you can find some first demos of this organ. These have been produced with MIDI files, live performances will follow shortly. This is the trial version of the sample set of the Schyven / van Bever organ in Notre Dame de Laeken Small Edition (Belgium). The organ definition file as well as the samples are encrypted, hence the trial version will only work with a registered Hauptwerk installation (with dongle). Only the 15" gui screen is included. The sound will stop about every minute for 5-6 seconds. All stops will stay engaged and you can continue playing after this brief pause. Please click here to download the trial version. Like an arrow the Avenue de la Reine points directly to the neogothic L’eglise Royale Notre-Dame de Laeken. The church, initially designed by the architect, Joseph Poelaert (1817- 1879), as a royal tombsite, especially in memory of the very popular Belgium Queen, Louise Marie of France, was erected in 1854 and blessed in 1872. The church was finally completed according to newer plans in 1908. Since its consecration, all of Belgium’s monarchs have been buried in its crypt. For this church the Belgium government conmissioned a great organ as early as 1870. Pierre Schyven finally starts working on the organ in Laeken from 1871to 1874. Under the name of P. Schyven & Cie., Pierre Schyven, born in Brussels in 1827 takes over the famous organ workshop of Merklin-Schütze together with Armand and Jacques Verreyt. Supported by François-Joseph Fétis, the director of the Brussels Conservatory, Joseph Merklin and Friedrich Schütze had played an important role in regenerating organ construction in Belgium. Merklin-Schütze had taken over Ducroquet of Paris in 1855. Charles-Spakman Barker was their workshop master there until 1858. Pierre Schyven had been with Merklin since 1843 and was their workshop head in Brussels since 1851. Instruments out of the late Brusseler Merklin production and early Schyven pieces do not differ greatly. Despite the fact that Cavaillé-Coll dreaded Schyven´s Paris workshop it is said that Cavaillé-Coll admired Schyven´s Brusseler tradition. Even though one cannot call Schyven a Cavaillé-Coll imitation he was dedicated to the same organ manufacturing principles. Next to the organ in the cathedral in Antwerp, it is his greatest work. The organ has 51stops, 13 pedal-levers, the Grand-Orgue and Récit have 2 Barkers levers (wind pressure is 170 mm Watercolumn) and a gigantic neogothic organ chest. Alphonse Mailly and Alexandre Guilmant play the inaugurating concert in 1874. For this concert the later especially recomposed his Symphony Ias an organ solo, dedicating it to the attending King of Belgium. After cleaning and intonating the organ in 1888 Schyven carries out some repairs on its mechanics and on the bellows. He replaces the Récit and Grand-Orgue Barker levers with more precise ones. New Magazin bellows with two places for windmakers are installed and wind pressure is reduced from 170 mmWC to 120 mmWC. Pierre Schyven retires from the firm 1905. As a business partner, his son François (1856 - 1927), had in the last 10 years incorporated more and more industrial production methods. François keeps up the business to his death without building any new instruments. Maintenance of the organ is transferred to Samuel van Bever (1851-1916) in 1902. Together with his brotherAdrian (1837 - 1895) he had worked in the famous Hippolyt Loret organ workshop. He followed Loret when he moved his workshop to Paris in 1866 and worked there until 1878. He perfected his craftsmanship with Aristide Cavaillé-Coll, whose concepts continued to influence his entire career. As of 1880 the Van Bever brothers take over the Loret workshop and continue the tradition in Laeken. Van Bever undertakes several changes on the organ disposition; in the Récit Clairon 4 replaces Cor 16’, the Positif Ophiclëide 16’ now becomes 8’ and is exchanged for the Cor anglais 8’ in the Grand-Orgue. Besides cleaning and intonating, all the bellows are adjusted and the Récit is revised. Montre 16’ receives new conducts and the Positif gets a new Barker lever. In 1906 the organ had to be dismantled to allow construction of the church steeple to finish. After the steeple was completed 1908, the church’s Rosette was left visible for architectural reasons. As a result, the ornamental Schyven Prospect had to be eliminated. 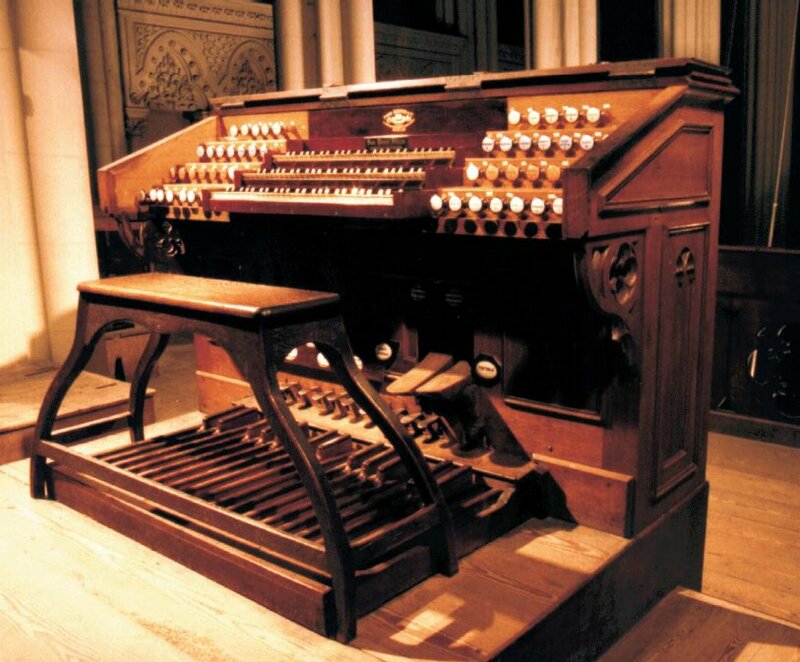 Despite this loss, the organ was installed with the original windchests, console and the old pipes. The Positif receives new windchests and two additional registers; Musette 8’ and Unda maris 8’. A Quinte 5 1/3’ displaces the Trompette Céleste of the Grand-Orgue. The Récit and Positif stop tracking are now pneumatically supported, while the Grand-Orgue and Pédale remain mechanical. The large Sous-Basse 32 pipes are installed in narrow cabinets along the back walls of the church aisles so as not to obstruct views of the Rosette in the nave. At the church’s consecration May 10th, 1912 the organ was presented almost as it is today. After Salomon Van Bever died 1916, his nephews, the Draps brothers, took over the workshop and the maintenance of the instrument. Samuel Eyckmans (1889 - 1978) followed later. Patrick Collon of Brussels cautiously restores the organ between 1975 and 1978. He exchanges the Grand-Orgue pipe Quinte 5 1/3´ with a Doublett 2´ so that the Organ stands out to today in all its grandeur as the summit of Belgium’s symphonic organ building. Etiènne de Munck of Sint-Niklaas has been responsible for the organ’s maintenance since 1994. He also tuned the instrument for this recording.